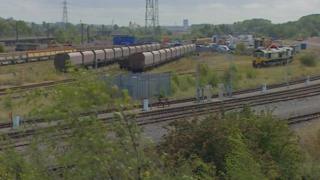 A rail firm has been found guilty of breaching health and safety laws after a teenager was injured in a depot. He suffered an electric shock after getting into the DB Cargo UK Tyne Yard depot near Birtley in 2014, and ended up losing part of both legs. Newcastle Crown Court was told the firm knew there were risks on the site, and did not do enough to deter trespassers. DB Cargo UK, which denied one offence under the Health and Safety at Work Act, will be sentenced in February. The jury was told the then 13-year-old and three friends were trespassing in the yard on the evening of 14 June, and he climbed on top of a wagon which was close to overhead lines carrying 25,000 volts. An investigation found that the firm knew the site attracted trespassers, as shown by the presence of graffiti, fly tipping and vandalism, as well as reports of drinking and drug taking there. However, there was not a fence or gate stopping people leaving a public bridleway and walking onto the yard, and no warning signs to deter them. Security patrols only worked during daylight hours, and CCTV cameras were switched off. Following the verdict, Robert Allen from the firm said: "DB Cargo UK is disappointed by today's decision but will of course consider carefully any particular findings of the court. "The company operates from a significant number of railway sites throughout the UK and safety is our priority. "We will continue to actively support and participate in industry initiatives to promote awareness of the dangers associated with trespass onto railway sites."